The Nationals could still sign Bryce Harper and stay under the CBT cap! 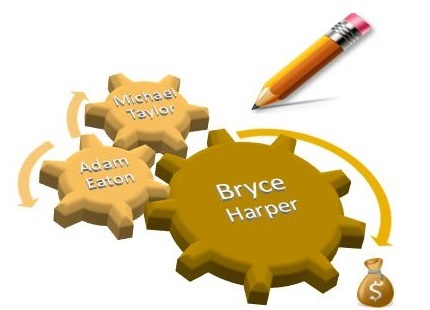 Over a month ago, we did a simulation of how the Nationals could accomplish all of their off-season goals and re-sign Bryce Harper. Even after inking Patrick Corbin to a lucrative deal, it is still possible to bring Harper back and stay under the CBT cap of $206 million for 2019. Currently, the Nationals are at approximately $184 million using the CBT calculation. That number does not include incentives which means the Nats need at least a $7 million cushion which would give the team only $15 million to spend on Harper — and that is where the creativity would come into play because you have to figure Harper’s AAV would be at least $27 million a year. 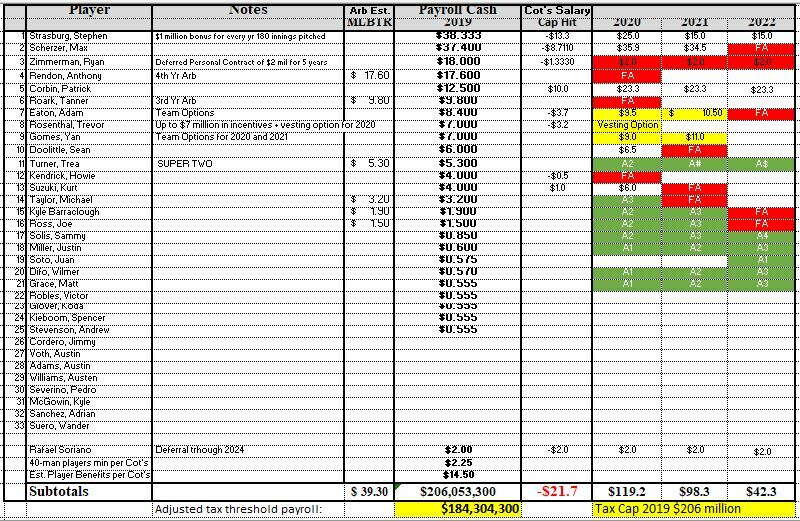 Rework Ryan Zimmerman‘s contract to extend it by 2 years at $27 million over the remaining 3 years by paying him $4.5 million for 2020 and 2021. That would reset his AAV to $9 million a year and save $7.3 million towards the AAV. $22 to spend. Trade Tanner Roark. That saves $9.8 million, but then general manager would need to replace him with a pitcher up to $7 million. Candidates are Jeremy Hellickson and Wade Miley. That would save about $4 million. $25 to spend. Trade Michael A. Taylor. That saves $3.2 million. $28 to spend. What all of this means is that the Nationals could be done with their off-season without adding a left-handed hitting 2nd baseman and no acquisition of a lefty 1st baseman behind Ryan Zimmerman on the depth chart, however, Scott Boras who is Harper’s agent made it abundantly clear that his client could play first base. “Well, Bryce Harper was a catcher, and Bryce Harper is an elite athlete,” Boras said. “What separates Bryce is that he has the ability and has been and Bryce always during the course of the season takes groundballs at first base all the time, and he is very familiar with that position. What it also could translate to is that Victor Robles is the starting centerfielder on Opening Day and either Juan Soto or Harper would be the back-up 1st baseman. The 2nd base job would be shared by Wilmer Difo and Howie Kendrick on Opening Day with Carter Kieboom in the wings. The lineup looks like it needs another left-handed bat, and yes, it seems like a waste to play Adam Eaton off of the bench. This exercise is for illustrative purposes only. For anyone questioning the rules on re-doing Zimmerman’s deal, we spoke to Jeff Euston who is the CBT expert at Baseball Prospectus, and he maintains the Cot’s salary register. Due to the paucity of situations where contracts have been reworked for CBT purposes, we wanted his expert opinion on whether or not a new Zimmerman deal would work. “In theory, yes. But it’s up to each player and club whether to treat it as two separate deals (the existing deal with a new extension) or as two deals merged into one new contract. A club like Washington will prefer one new deal for the reduced CBT hit, as you describe. We did that interview with Jeff Euston before the Dodgers did exactly this type of renegotiation with Clayton Kershaw which the MLBPA approved. There is certainly precedence that these types of renegotiations with extensions have happened before. The Nationals have the opportunity to be creative, but it certainly looks like if you re-sign Harper you have to wait on extending Rendon. That would be an analysis for another day.